Phobos has rolled through all its phases, and disappeared from the Martian sky. More stately Deimos was westering as the last die was rolled, and the players prepared their chariots for the long ride home in the Red Planet’s cold night. 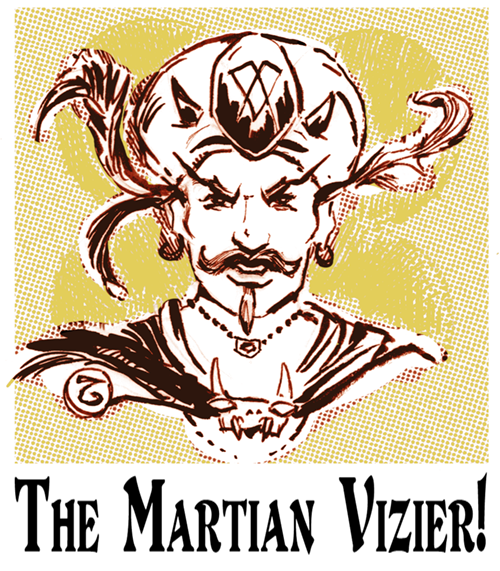 The Great Martian Vizier Koraz-hu was not ready to find sleep yet, so he made his way to the Great Study, where a new publication awaited his approval. 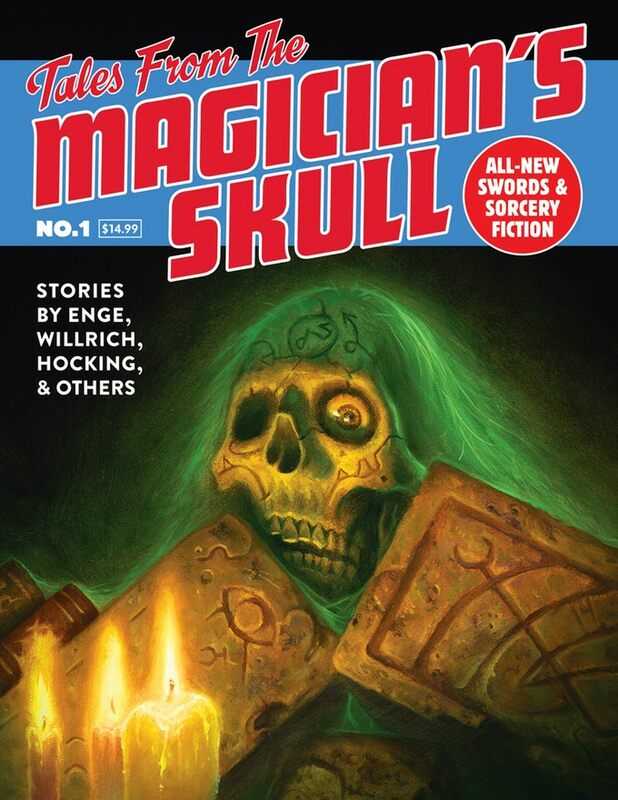 Tales From the Magician’s Skull is a new periodical of Swords & Sorcery fiction, published by Goodman Games. The first issue is out (84 pages, not including covers! 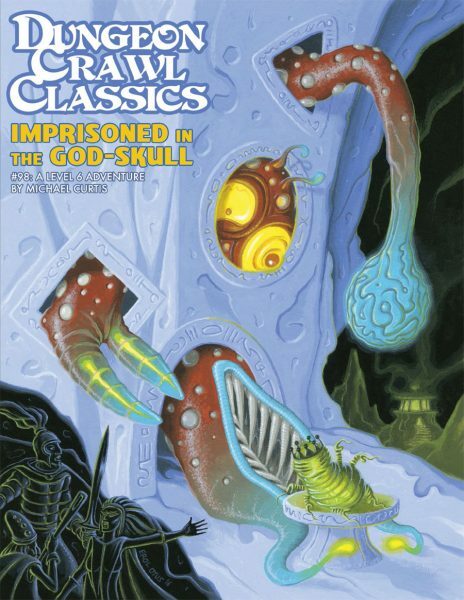 ), with stories by Chris Willrich, James Enge, Bill Ward, Aeryn Rudel, Howard Andrew Jones, C.L. Werner, and John C. Hocking. Art is provided by Jennell Jaquays, Doug Kovacs, William McAusland, Brad McDevitt, Ian Miller, Russ Nicholson, Stefan Poag, and Chuck Whelon. 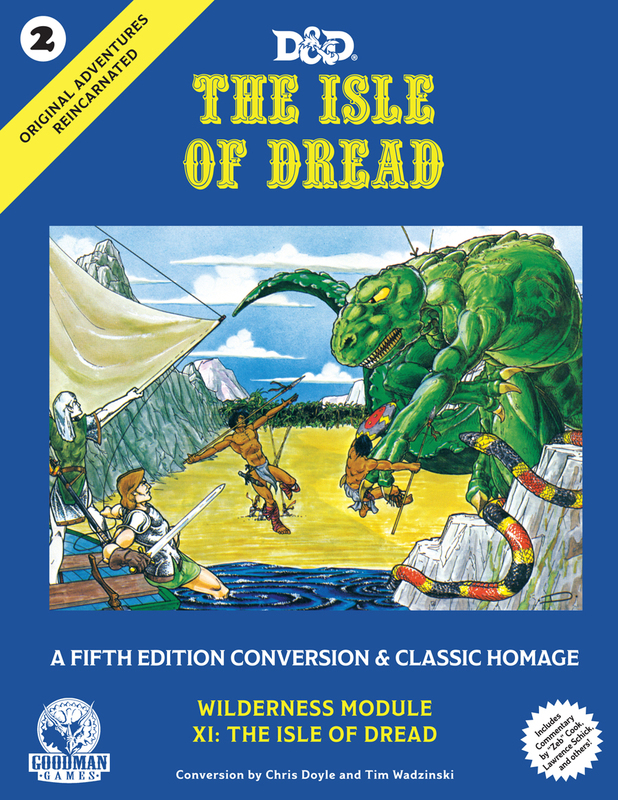 The cover is by Jim Pavelec. The first issue features seven stories, ranging in content and tone. 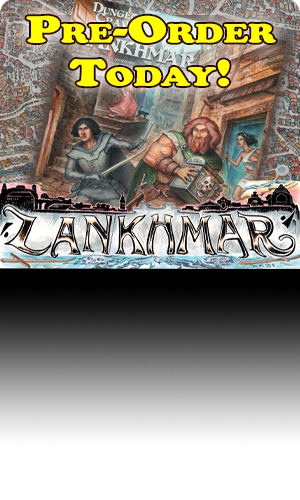 Several stories tie in to established series. For instance, we are given a Gaunt and Bone adventure, a story of Morlock Ambrosius, and a tale from the World of the Archivist. What Lies in Ice, by Chris Willrich, sees Persimmon Gaunt and Imago Bone engage a swarm of un-dead hands upon a frozen sea – and discover the last vestiges of an ancient Nobecan sorcerer-king. In The Guild of Silent Men, by James Enge, Morlock Ambrosius solves a murder mystery for the Guild of the Silent Men – those without the protection of family, professional guild, or social club. 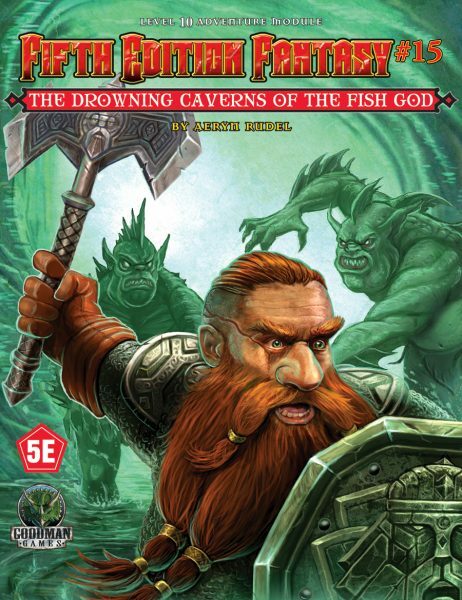 Bill Ward’s Beneath the Bay of Black Waters (A Tale of Shan Spirit-Slayer and the Banner General Bao) sends the protagonists to stop a drug ring…and they discover that the drug in question is supplied by Lovecraftian fishmen. Beyond the Block, by Aeryn Rudel, is a stand-alone story in the spirit of the old weird tales, where revenge reaches past the grave…from the point of view of the revenant! Howard Andrew Jones’ Crypt of Stars begins the Chronicles of Hanuvar Cabera, surviving rebel general from the Dervani invasion. There Was an Old Fat Spider, by C. L. Werner, is another stand-alone story, but one which could easily set up a series. “Be careful who (or what) you trust” is a theme in this story, and one wonders whether the alliance at the end will ultimately turn out any better. The Crystal Sickle’s Harvest, by John C. Hocking, is a tale from the World of the Archivist. Defending the tombs of nobles from grave robbers, we discover that sometimes the dead can protect themselves. 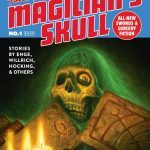 Apart from the stories, we are given a directory of Chapters of the Skull, a list of kickstarter backers, five pages of bookstore recommendations, and—wonder of wonders—DCC RPG statistics for creatures, magic items, and even spells featured in these tales. Terry Olson even manages to give us a new race-class! 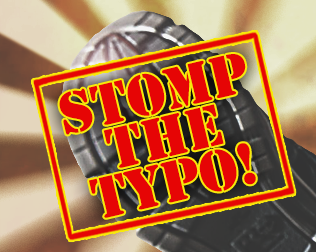 Although the content may be reminiscent of the days of old, the production values are not. 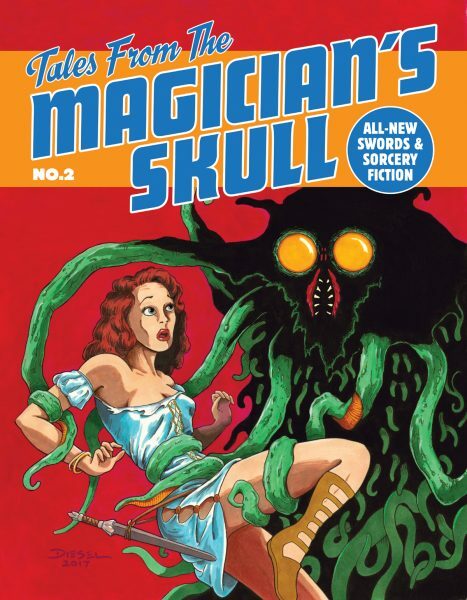 Rather than printing on the cheap paper that the pulps were named for, Tales From the Magician’s Skull is printed on excellent, heavy stock that it is a joy to both see and feel. The magazine is perfect bound, rather than saddle-stitched, so these things will not fall apart in a hurry! Although the Martian night is long, the sun has risen again before the Vizier sets the magazine down and heaves a contented sigh. This is the writing of his youth, reborn for a new age! 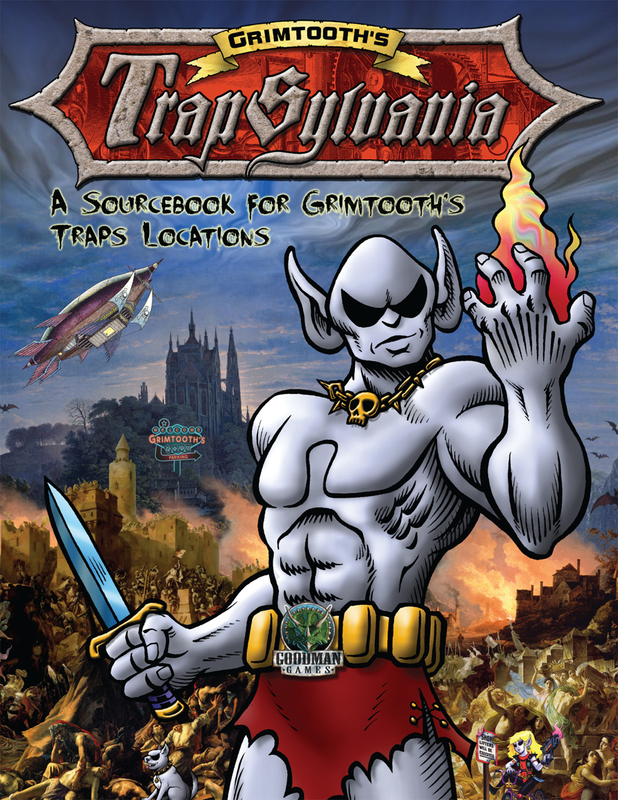 You can pick up it up at your FLGS now! It’s also available in our online store!